As the competition continues to grow, we need your help to sustain the success of this exciting and impactful event! At last year’s State Competition, 46 schools throughout Florida were represented by 249 Mathletes and 63 coaches. These talented middle school students would miss this opportunity to shine without your help! Only with the support of our members and member firms is Florida MATHCOUNTS possible. Help Make a Difference and Sponsor Florida’s State MATHCOUNTS Competition today! 2018 Florida MATHCOUNTS…had another successful year! 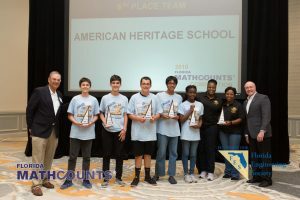 The Florida Engineering Foundation is proud to continue its sponsorship of the Florida MATHCOUNTS program, which culminated in the middle school math state competition. 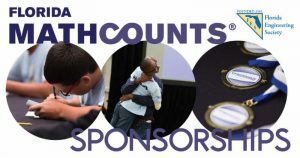 The Florida Engineering Foundation is the largest sponsor of Florida MATHCOUNTS, providing $13,000 of support this year! After hours of rigorous testing and a thrilling, head-to-head Countdown Round, the top ten Mathletes® were finalized. The top four Mathletes® are shown below and represented Florida in the National MATHCOUNTS competition. Click HERE for more information about the Florida MATHCOUNTS program. Click HERE for general information about MATHCOUNTS.